Codemasters is best known for its great racing games, such as Dirt, GRiD, and F1– all three realistic racing simulations. 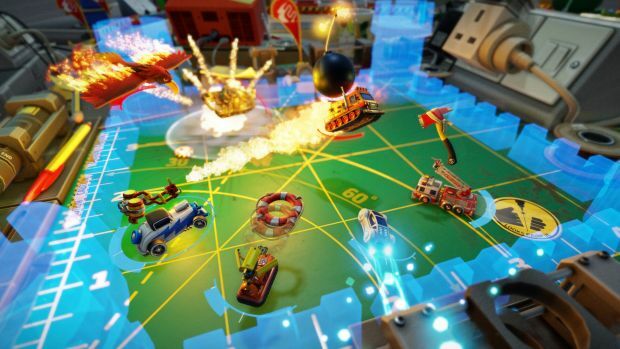 And then there is the upcoming Micro Machines revival, which Codemasters is also helming. The game seems raucous fun, and it looks like the perfect fit for Nintendo’s Switch. So what are the odds that we see the game on Nintendo’s hybrid system any time soon? Speaking to WCCFTech, Gavin Cooper, Chief Game Designer, said that Codemasters currently has no announcements regarding the Switch- but that it is watching what happens with the system with great interest. This sounds fair- hopefully, the Nintendo Switch gets a port of this game eventually. Games like Mario Kart and Rocket League show us there is an interest for these kinds of titles on the platform. If you want to play it before the potential Switch version, it will be available on June 3o for Xbox One, PS4, and PC.